Deep watched the newscaster play the video of Lacey fighting off the FBI agent and escaping from a murder scene the night before. Now, she's turning herself over to the police. What Deep's practiced eye saw in the video was a highly-choreographed crime. But somehow Lacey had thwarted the professionals' plans. ??? A USA Today Bestselling Novel! Download your copy now to join their fight for survival. 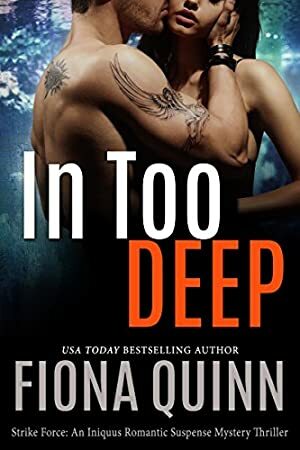 **In Too Deep is the first book in the Strike Force Series. Each book is a stand-alone, with no cliffhanger endings. Log In to track Fiona Quinn on eReaderIQ. to be notified each time the price drops on any book by Fiona Quinn. to stop tracking Fiona Quinn. We started tracking this book on December 5, 2017. The price of this book has changed 8 times in the past 500 days. The lowest price to date was FREE last reached on March 11, 2019. The highest price to date was $4.99 last reached on March 11, 2019.